One of the most visited regions in Southern Italy is Campania. With its diverse landscape, Roman Empire and ancient Greek heritage, as well as excellent buffalo mozzarella it is easy to understand the attraction. Straddling cliffs that roll into the Mediterranean Sea, chic islands, archaeological sites, emerald grottoes, imposing Mount Vesuvius and mythical rocks are some of the treasures of this region that are waiting to be explored. Sorrento is an ideal base for visiting the enchanting town of Ravello, the exclusive village of Positano, and Amalfi, whose spectacular cathedral dates back to the 11th century and overlooks its main square, the Piazza Duomo. Maratea, further south, takes you into the unspoilt region of Basilicata which is steeped in history. Greek ruins, medieval abbeys, castles and churches are in abundance whilst the dramatic coastline, which touches the Tyrrehenian Sea, further enhances the mountainous landscape. Private transfer on arrival to your hotel in Sorrento. Overnight at the Antiche Mura Hotel, Sorrento. Day at leisure. Walk into the historical centre of Sorrento and wander though the maze of narrow streets with its shops, restaurants and cafés. Famous for its production of Limoncello, it is not uncommon to see this liqueur (made from lemon rinds, alcohol, water and sugar) on many menus. Visits for a demonstration on how this well known tipple is made can be arranged locally. Day at leisure. No trip to Sorrento would be complete without a visit to the famous archaeological sites of Pompeii and Herculaneum, buried in AD79 when Mount Vesuvius erupted. 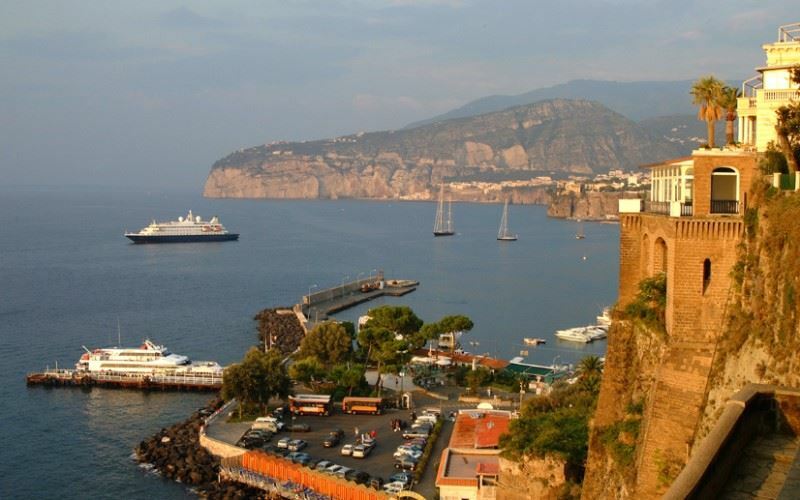 Excursions depart from Sorrento to Pompeii between May-Oct. Private excursions with an English speaking driver can always be arranged. After breakfast, collect your hire car from the downtown office in Sorrento. Drive to Maratea (209km / 3 hours) and check-in at the Hotel La Locanda delle Donne Monache. A meticulously restored 18th century monastery, the hotel offers a secluded hideaway and an ideal base from which to explore. Overnight at the La Locanda Delle Donne Monache Hotel, Basilicata. The historical town of Maratea is one of the most visited tourist destinations in Basilicata. Immerse yourself in the history of the town with its typical narrow streets adorned with ancient arches, charming main square ‘piazzetta’ and over forty churches. Archaeological finds from the region, provide an insight into the past and are on display in the Convento dei Cappuccini and the Palazzo de Lieto Museum. Complete your day on the waterfront, Maratea port is a popular area with lively bars and dining. Day at leisure. A variety of activities are available in Basilicata, many of which are within easy driving distance. Horse-riding, rafting, canyoning, diving, skiing and sea excursions can be arranged locally. Three ancient pathways can be found close to the hotel, each taking you on a trek through the Carpini forest to the Church of Madonna della Neve, the Christ statue (following the old route of St Biagio) or the Church of Madonna della Pietà. For sun-seekers, Castrocucco beach is just 4km away and a complimentary transfer service, sun beds and umbrellas is offered by the hotel. Basilicata boasts many hilltop towns, each waiting to be explored. Travel to Melfi (179km), once the Norman capital, and home to an impressive castle which dominates the town. Venosa (184km), an important Roman colony dating from 290BC, offers historic delights such as its archaeological area where the remains of an amphitheatre can be seen, along with a huge castle and cathedral, both dating back to the 16th century. Perhaps most popular, is the city of Matera (178km) with its lower district and ‘Sassi’ houses. These cave dwellings, dug into the rock, were once inhabited by the people of Matera and today, although empty, are recognised as a UNESCO World Heritage site. Drive to Naples airport for your return flight home. La Locanda delle Donne Monache is a charming property housed within the walls of an 18th century monastery originally occupied by the Visitandine nuns. La Locanda delle Donne Monache is a charming property housed within the walls of an 18th century monastery originally occupied by the Visitandine nuns. Located in the hilltop town of Maratea, the hotel’s interior is modern and bright with intimate seating areas and filled with fascinating and unusual artwork. The restaurant ‘Il Sacello’ which opens on to a panoramic garden with large swimming pool and solarium, offers its guests many gastronomic and culinary delights drawing on regional flavours. Note: This property does not have a lift and is not suitable for those with walking difficulties.